Apple and Crystallized Ginger Crisp | A Bushel of What? It's just about the middle of October and I've made apple crisp at least three times this season. It's a great dessert to prepare a few hours ahead and then pop into the oven while you sit down and enjoy dinner with some guests; By the time you've finished your meal and cleared the table, the aroma of apples and spices fill the kitchen and the crisp is almost ready to serve. Delicious. I'm a firm believer in extra crisp with my apples, so I've made sure this recipe isn't lacking in that department. It also utilizes crystallized ginger which provides an extra little bite. If you don't like ginger, or don't happen to have any on hand, just omit it and enjoy the cinnamon-sweet, buttery crunch the traditional way. 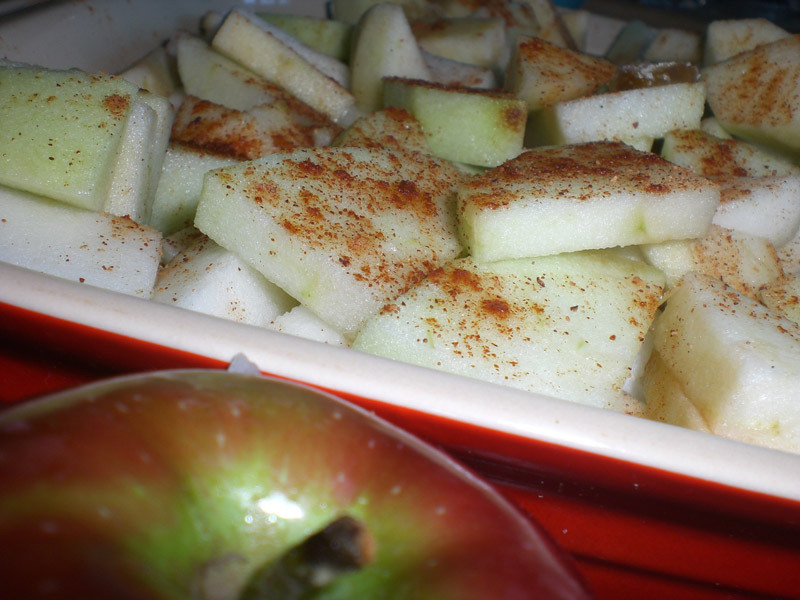 Peel, core and very coarsely chop apples, and add to dish. Squeeze lemon over apples. Sprinkle with a little ground nutmeg. Bake 45 minutes, or until apples are bubbling and crisp is browned. Let sit 10 minutes and if desired, serve with vanilla ice cream or freshly whipped cream. i was too lazy (plus actually kind of not feeling so well) but downstairs with saskia & a lot of apples that needed doing so instead of a crisp, i made applesauce (with ginger instead of cinnamon ) & baked some apples with a little maple syrup & cinnamon. i cut e'm up--so tasty. then i went back to bed for a while. I *just* came across your blog looking for turnip recipes. I'm also in MA, just started my Winter CSA. Great blog! I look forward to reading more! I just found your blog - I particularly like your "about me" page! I live on a backyard "farm" in MA, also. I did try this recipe last night and found it to be a winner. I tweaked it somewhat to fit our family's taste, but the basic is a good one. Thanks.